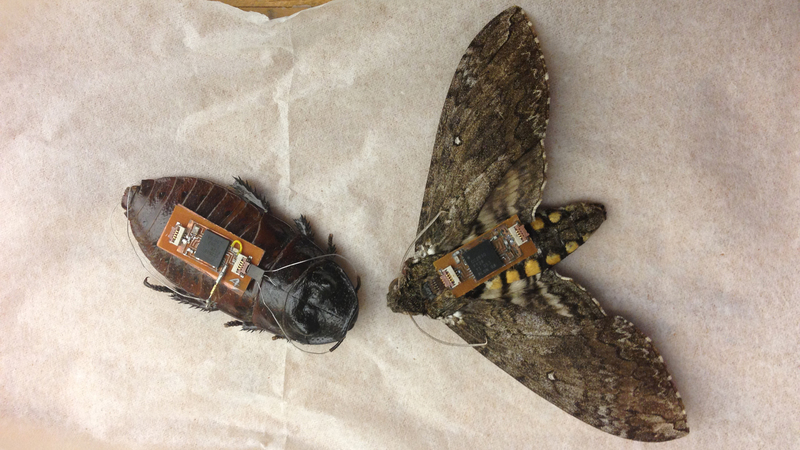 Cyborg Insects Proposed by @NCState University to Map Areas After Disasters « Adafruit Industries – Makers, hackers, artists, designers and engineers! I always appreciate a good bug-bot story, and while I’m totally okay with one or even a few cyborg insects, the notion of a ‘swarm‘ definitely makes me cringe just a bit! But if it’s all for the good of humanity and mapping an area after a disaster like an earthquake or an otherwise inaccessible area, I’m all for it. These “biobots” developed by a research team at North Carolina State University could map out areas or collapsed buildings in the wake of a disaster. Edgar Lobaton and Alper Bozkurt’s project equips cockroaches with sensors and takes advantages of their frenetic natural movement to map out hard-to-reach areas. They propose deploying the robotic insects by unmanned aerial vehicle (UAV), which would transport a swarm of them to the necessary location.